We have just released the third quarter “Elliman Report: Miami, Boca Raton, Fort Lauderdale & Palm Beach,” the leading resources on the state of these markets. In our quest to provide the greatest depth of information, we recently expanded our reports to include even more analysis. Miami is now being presented as two regions: Miami Coastal Mainland and Miami Beach/Barrier Islands to better reflect those markets. As always, our market reports are produced in conjunction with Miller Samuel to provide you and your clients with the most comprehensive and neutral market insight available. Housing prices in the Miami Beach/Barrier Islands moved higher, pulling additional inventory into the market. Although the market hasn’t kept up with last year’s blistering sales pace, the time to market a property fell. Luxury housing prices gains continued to outperform the overall market. Miami Coastal Mainland housing prices increased above last year’s levels. The luxury housing market showed strong results as the size of the distressed housing market continued to fall. Inventory increased as more sellers were drawn into the market by rising prices and the number of sales increased. Overall housing prices in Boca Raton were higher than last year as the number of sales declined from last year’s heavy volume. Luxury housing market fell short of last year’s levels as marketing times and negotiability continued to fall, keeping the market tight. The Fort Lauderdale housing market continued to see rising prices and additional inventory added to the market. The number of sales fell short of the high volume experienced last year. Luxury condo prices showed stability as the luxury single family prices increased faster than the overall market. 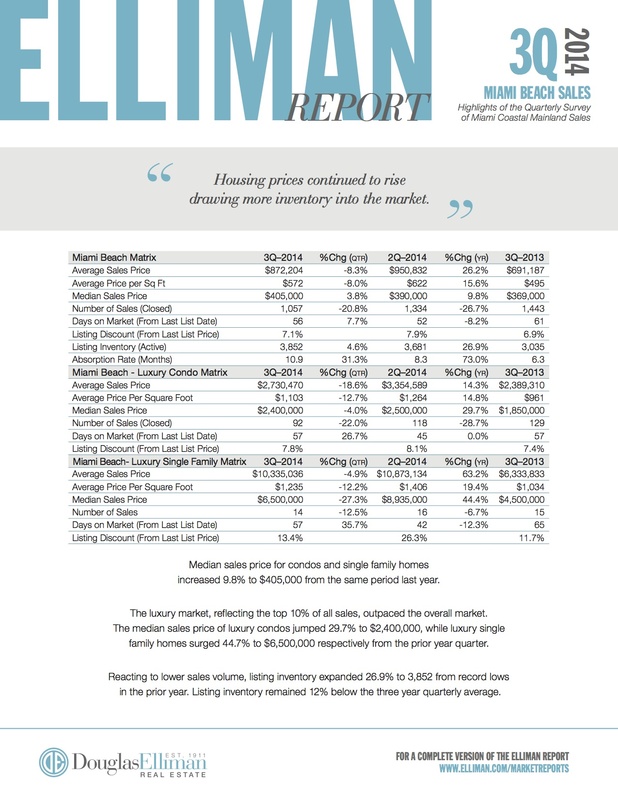 Palm Beach housing prices jumped led by the luxury market and the shift to larger sized sales. Listing inventory continued to fall across the majority of the market, keeping the pressure on prices. Sales fell short of last year’s levels as marketing times declined, hampered by the lack of supply. At Douglas Elliman, we are constantly looking for ways to provide our clients with better information, empowering them to make more informed decisions. Our efforts to create this growing market report series reflect our strong belief that access to timely information is a vital resource in a market that is constantly changing. Committed to providing the best information in the industry, we are proud to offer this service to our clients. 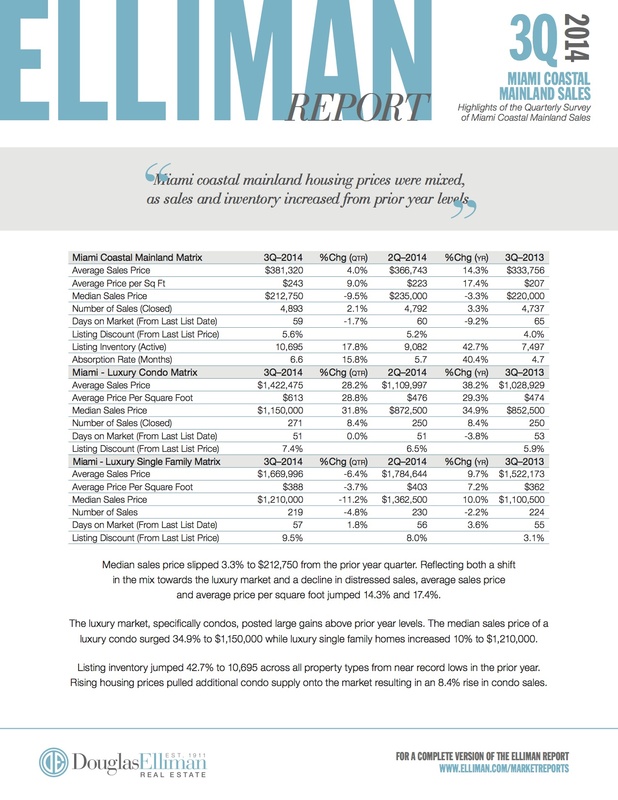 Explore our full market report series covering Manhattan, Brooklyn, Queens, Long Island, The Hamptons, North Fork, Westchester/Putnam, Miami, Boca Raton, Fort Lauderdale, Palm Beach and our soon to be released Los Angeles report at http://www.elliman.com/marketreports. *Visit the new http://www.elliman.com to search more than 100,000 listings and access all of our current market reports.